[Episcopal Diocese of West Texas] The Rt. Rev. 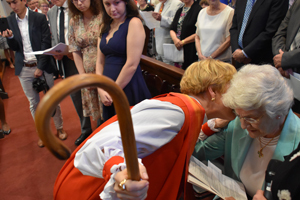 Jennifer Brooke-Davidson was ordained and consecrated the sixth bishop suffragan of the Episcopal Diocese of West Texas on July 29 in a festive service at Christ Episcopal Church in San Antonio, Texas. She is the first woman to be ordained a bishop in the diocese. 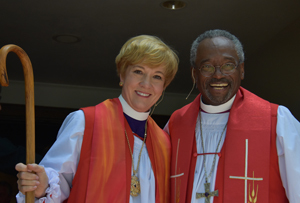 Presiding Bishop Michael B. Curry led the service as chief consecrator and preacher. More than 750 people attended the two-hour festive service. Curry told the congregation that Brooke-Davidson has said that the key to lighting the fire within yourself is a relationship with Jesus, and that people will see that fire and they will want to imitate it. During the celebratory service, 25 visiting bishops laid their hands on Brooke-Davidson as Curry ordained her a bishop and consecrated her for her role as Bishop Suffragan of the Diocese of West Texas. Visiting bishops included five women bishops from other dioceses across the Episcopal Church. Co-consecrators included the Rt. Rev. David M. Reed, bishop of West Texas; the Rt. Rev. Gary R. Lillibridge, retired bishop of West Texas; the Rt. Rev. Laura Ahrens, bishop suffragan of Connecticut; the Rt. Rev. Jennifer Baskerville-Burrows, bishop of Indianapolis; the Rt. Rev. Daniel Gutierrez, bishop of Pennsylvania; and the Rev. Dr. Ray Tiemann, Bishop of the Southwestern Texas Synod of the Evangelical Lutheran Church in America. Following the consecration, a number of gifts were presented to Brooke-Davidson, including a Bible from Curry, vestments, a stole, a pectoral cross, and a crozier, a gift from Nancy Hibbs, widow of the Rt. Rev. Bob Hibbs, the fourth bishop suffragan of the Diocese of West Texas. Bishop Hibbs had carried the crozier for 21 years during his ministry. Josh Benninger, director of music and organist for Christ Episcopal Church, lead the choirs of Christ Church, St. David’s Episcopal Church, and St. Thomas Episcopal Church, all of San Antonio, and Saint Elizabeth Episcopal Church in Buda. An orchestra accompanied the choirs comprising musicians from the San Antonio Chamber Orchestra. Following the service a picnic lunch of fried chicken and all the sides was served on the Christ Church lawns. Brooke-Davidson requested the “best church picnic ever” as her reception, and homemade pies made by attendees at the service were served for dessert. To complete his visit to the Diocese of West Texas, Curry led worship at St. Luke’s, San Antonio, on Sunday, July 30, where he spoke in a forum setting that morning and then preached and presided over the Eucharist. Brooke-Davidson will serve alongside Diocesan Bishop Reed. Reed was invested as the tenth bishop of the diocese in June, and he served previously as the fifth bishop suffragan of the diocese. Brooke-Davidson was chosen bishop suffragan at Diocesan Council held in February. She was ordained a priest in 2009 after graduating from Fuller Theological Seminary. She served as vicar of Saint Elizabeth in Buda from 2011 until June of this year. She also served as the assistant rector of St. Stephen’s Episcopal Church in Wimberley, Texas, from 2009-2011. Prior to ordination, Brooke-Davidson practiced commercial financial law for 12 years. She is married to Carrick Brooke-Davidson, and they have two grown daughters, Emma and Kate. The Episcopal Diocese of West Texas comprises 26,000 members in 87 congregations spread across 60 counties in Central and South Texas and covers 69,000 square miles. The diocesan headquarters are at the Bishop Jones Center in San Antonio. — Laura Shaver is communications officer for the Diocese of West Texas.